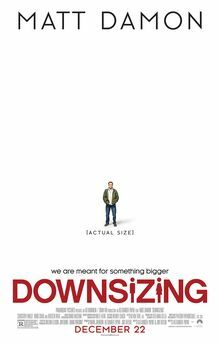 In the future, searching for a way to solve overpopulation and global warming, a scientist invents "downsizing", a process to shrink people to a height of five inches. Paul and Audrey Safranek, a married couple in Omaha with financial problems, meet Dave and Carol Johnson, who have downsized. While the inventors advocate that downsizing is environmentally friendly through the reduction of waste, Dave argues that its benefits extend far beyond that and improve one's life through the increase in value of their money. Read more on Wikipedia.